It’s no secret that I’ve got a soft spot for anything China…so it’s not a surprise that when Lisa Brackmann‘s debut novel Rock, Paper, Tiger came out (Soho Press, 2010), I devoured it. It’s a great story…a fantastic read…and good gracious, look at this cover art! Amazing. Just yesterday, June 7, the paperback was released (big round of applause). Whoop! Whoop! So welcome, Lisa, to Writerhead Wednesday. Let’s get started. Iraq vet Ellie McEnroe is down and out in China, trying to lose herself in the alien worlds of performance artists and online gamers. When a chance encounter with a Uighur fugitive drops her down a rabbit hole of conspiracies, Ellie must decide who to trust among the artists, dealers, collectors and operatives claiming to be on her side – in particular, a mysterious organization operating within a popular online game. When: often, but not always, late at night, when it’s quiet around me, and dark. Also: when I’m traveling. I find it incredibly inspirational just to be in a place and absorb what’s around me. The places I go to can be as far away as China and as close as my own neighborhood. I just need to be in that observational frame of mind to travel a long way. Well, I currently have this insane cat. She needs to be entertained! And if she’s not suitably entertained, she finds ways to entertain herself. For example: unrolling the toilet paper roll. That one’s easy to solve, I just have to remember to keep the bathroom door closed. Lately, though, she’s taken to trying to dismantle the cats’ drinking fountain. She’s been rather successful at this. It leads to a lot of water on the floor. So I have a laser pointer to distract her. I try to type with one hand and move the little red laser dot around with the other. I’m only moderately successful at this. The thing is, I’m not a writer for whom words come easily or quickly, so for me, most of the time, writing is a struggle. I’m not one of those “Oh, I just love to spend time with the voices in my head, if I don’t write and write and write I’d go nuts! The words just flow!” kind of writers. More like, “Put a gun to my head to make me start writing. No, I’d rather you just shoot me,” kind of writers. I do best when I write a little every day, even if it’s only a paragraph, rather than save it up for some major burst of inspiration that rarely comes. So I probably interrupt my own writerhead far more than any external force interrupts it. Except for the dude on the street over from mine with the World’s Loudest Motorcycle, which apparently needs to idle for excessive periods of time both to warm up and to shut down. I swear I’m gonna stick a potato up that pipe. For me, writerhead is an irresistible force hoping to dodge the immovable object. Lisa Brackmann’s debut novel, ROCK PAPER TIGER, set on the fringes of the Chinese art world, made several “Best of 2010” lists, including Amazon’s Top 100 Novels and Top 10 Mystery/Thrillers, and has been nominated for the Strand Magazine Critics Award for Best Debut Novel. Her second novel, a literary thriller set in Mexico, will be published by Soho Press in early 2012. 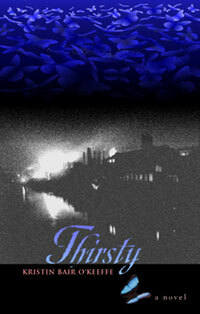 Her first published short story appeared in Akashic Books’ SAN DIEGO NOIR (June 2011). You can connect with Lisa on Facebook and Twitter (@otherlisa). Also be sure to check out her website (www.lisabrackmann.com). This entry was posted in China, Creativity, Fiction, Literary Life, Writerhead, Writerhead Wednesday and tagged author, authors, China, fiction, Kristin Bair O'Keeffe, Lisa Brackmann, novel, Paper, publishing, Rock, Shanghai, Tiger, travel, writer, writerhead, writerhead wednesday, writing, writing process. Bookmark the permalink. This interview is making me want to read the book. BOOYAH! And yes, great cover art! Happy to share it, Jennifer. Thanks for popping by! BOOYAH! Thanks for having me, Kristin!